Vicki Flaxman (Williams–she is married to Van Williams, TV’s Green Hornet) was one of a handful of female Malibu surfers back in the late 1940s-early 1950s, along with Claire Cassidy, Aggie Bane (Quigg), Darilyn Zanuck (movie mogul Darryl Zanuck’s daughter) and Robin Grigg (Ricky Grigg’s sister). 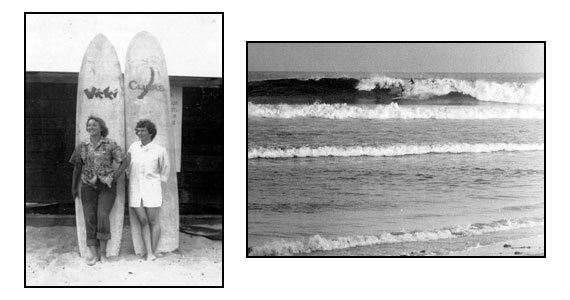 Vicki started surfing in 1949, her first session was tandem surfing with legendary waterman Pete Peterson and her first board was shaped by legendary craftsman, Joe Quigg. The wood for this board was purchased at General Veneer in 1954, where it was glued up and then brought home and shaped in the backyard by Malibu legend Matt Kivlin. Bunny Kahanamoku painted the tiki on the deck (are you starting to see a “celebrity surfer” pattern here?). Taking the board on one of her annual summer sojourns to Hawaii; Rabbit Kekai saw the board and was anxious to ride it. He gave it his “thumbs up” approval. With the addition of this board donated by Vicki, we now have a well-rounded quiver of Kivlin balsas; this semi gun, a Malibu Chip, and a Makaha model. Our 4th Kivlin, another balsa “Chip” will be put up for auction on May 11, 2013. Pictured clockwise from above: Vicki Williams and Claire Cassidy. Vicki and Buzzy Trent, Malibu. Aggie Quigg and Vicki. Vicki and Robin Grigg.